The 2000-year-old tradition of carpet weaving is so ancient and rich that it can hardly be described in just a few short pages. 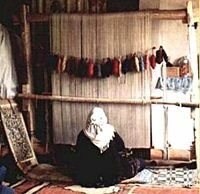 Our aim is here to provide a brief overview of the history and culture of handmade Turkish rugs. Most handmade rugs are classified according to their country of origin. The history of Turkish carpets begins in central Asia where the people of this region where generally nomadic-roaming and resettling from place to place throughout the year. Their homes were essentially tents that could be assembled, disassembled and transported with them to their subsequent destinations. Given this attribute of constant relocation, the necessity for lightweight, mobile and easily compactable commodites arose. Thus, the manufacturing of rugs used as floor coverings for their tents suited this purpose. A flat woven rug, called a kilim, could be produced simply and quickly and was the first style of rug to be developed. The Kilim is considered ' The mother of all carpets. Over time, these nomadic tribes slowly migrated to the region we now knows as Anatolia, and manufacturers of kilim rugs began to incorporate intricate designs (commonly geometric) patterns and colors into their weaving, these patterns, designs and colors were unique to each tribe, symbolic of their journeys and adventures, and embodied a rich sense of spirituality and emotion. material, weaving techniques, designs patterns and colors. At this time, an innovative combination of wool and cotton materials was used to produce rugs, and allowed for a greater variety of weaving techniques as well as more detailed designs and patterns to be created. 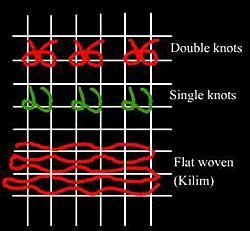 The pile weaving techniques was developed by tying knots of wool material onto a cotton based grid. Although this technique was much more tedious and time-consuming than the kilim technique, the results were extraordinary. The typical tribal geometric patterns and designs were now being replaced with very fine, detailed and desirable floral patterns. Hence, the pile technique became a worthwhile endeavor. Since the emergence of the pile technique and the use of the wool and cotton combination, other material combinations were subsequently utilized to create even finer detail and richer textures for carpet manufacturing. Finally silk rugs became and have remained the finest and most prized possessions of the carpet industry.